Bravissimi. 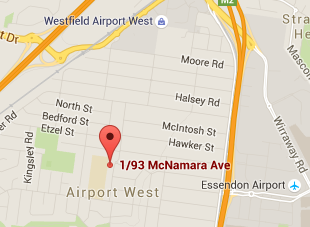 The Italian Language School of Melbourne. Bravissimi. Just like an Italian school. 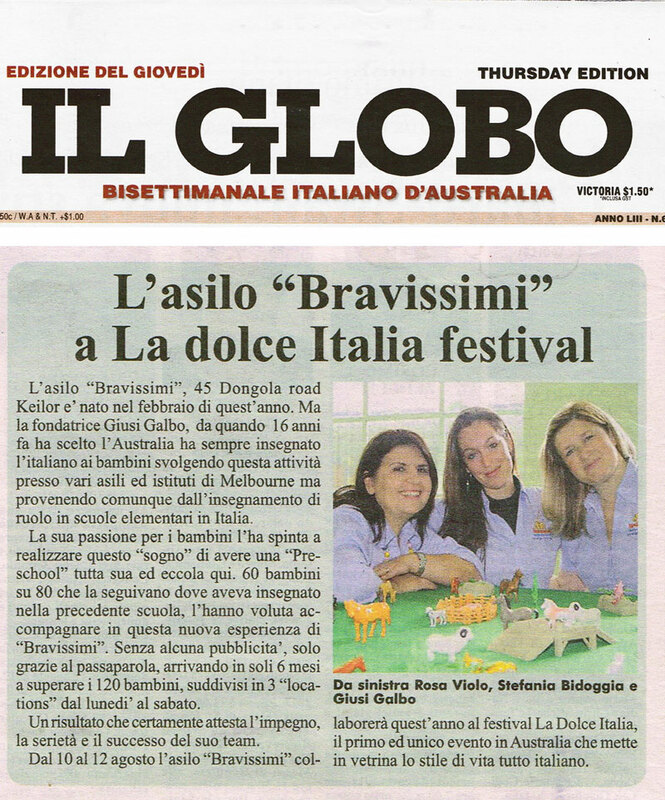 Bravissimi first opened its doors to the Italian-Australian community in Melbourne in 2011 offering, according to much consent, a remarkable service. Our school at Airport West reflects our values; the colourful and playful environment designed by the Bravissimi creative team provides an atmosphere that is inviting for all in attendance. Meet our Star Leader: Giusi Galbo. 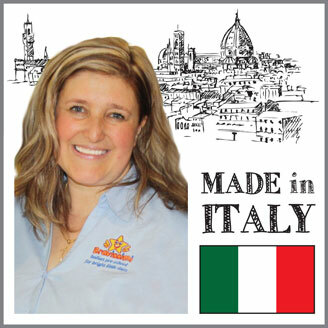 Giusi is an Italian fully qualified teacher and co founder of Bravissimi. She has started teaching in Italian primary schools in 1989. Her passion for teaching children has never stopped since. From Siracusa, Sicily, in her adult years moved to Como where she worked as a Primary School teacher for the Italian Department of Education where she practiced her methodology in Italy for several years. Her studies include the Maria Montessori Methodology. 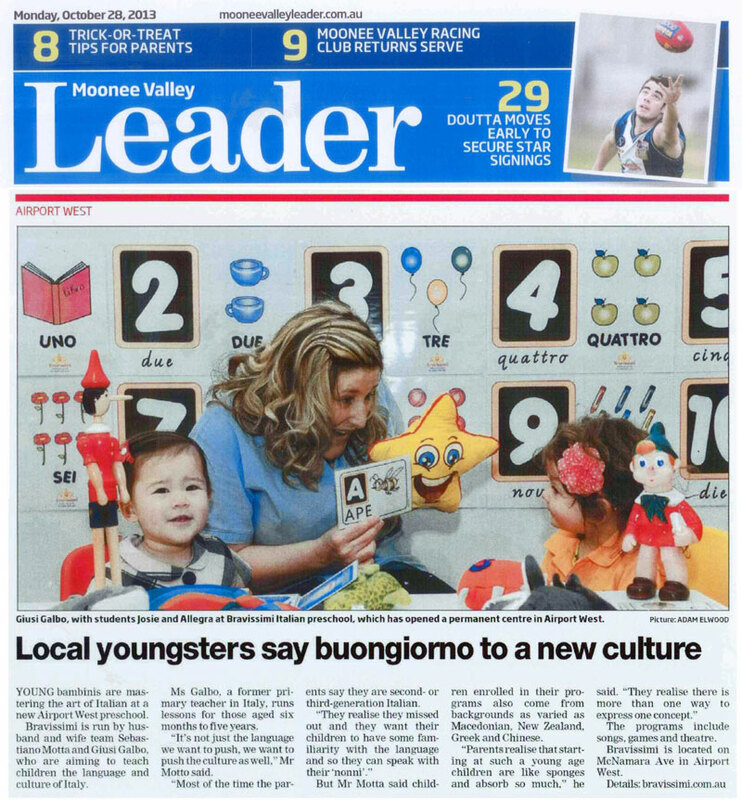 When moved with her family to Melbourne in 1996 and began working as an Italian teacher for both private schools and as a tutor for students aged 3 up to VCE levels. 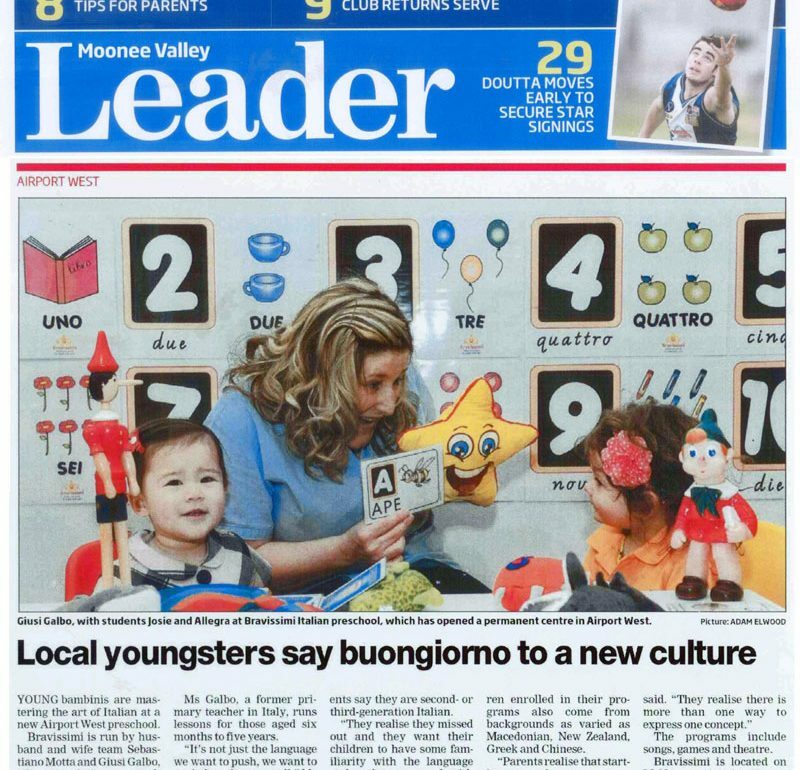 Giusi has great experience in teaching the Italian language in kindergartens, primary schools, secondary students and with adults in Melbourne. Over the years she has perfected a schooling system that matches with Australian standards. Giusi is now committed to keep improving her teaching methods and to train teachers in order to create a even more effective Bravisimi Team. Giusi Galbo. Italian teacher and childhood expert since 1989. As Montessori teachers, we see daily evidence of the importance of language in early childhood development. We also observe how easily and avidly young children acquire language and build vocabulary. 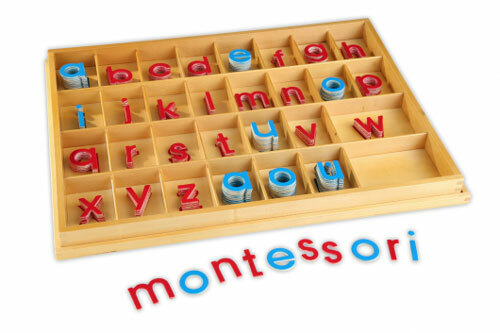 At Bravissimi we love using Maria’s Montessori Educational Materials. 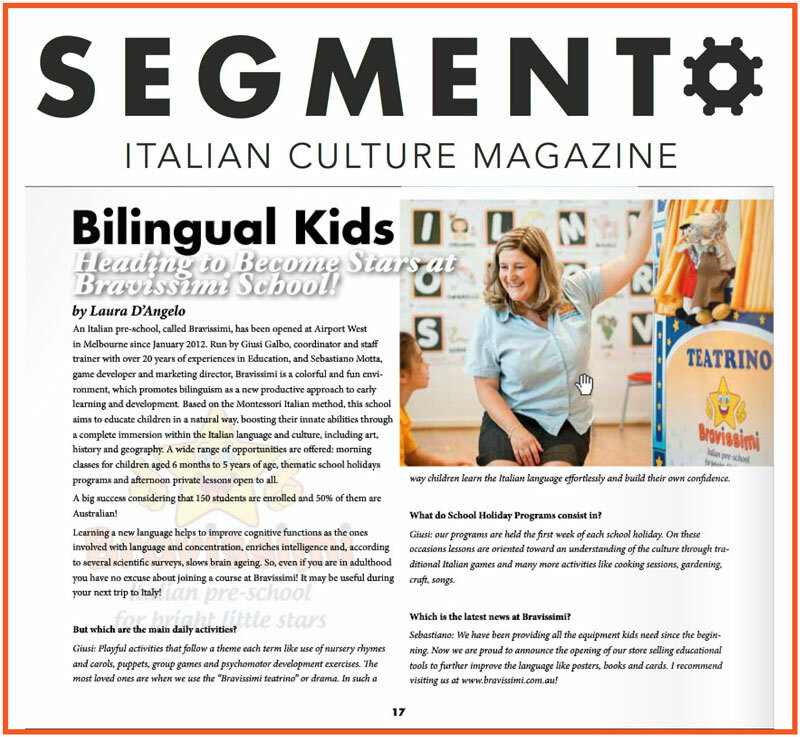 Not only is your child exposed to the Italian language but also the proven benefits this of this method from all over the world. 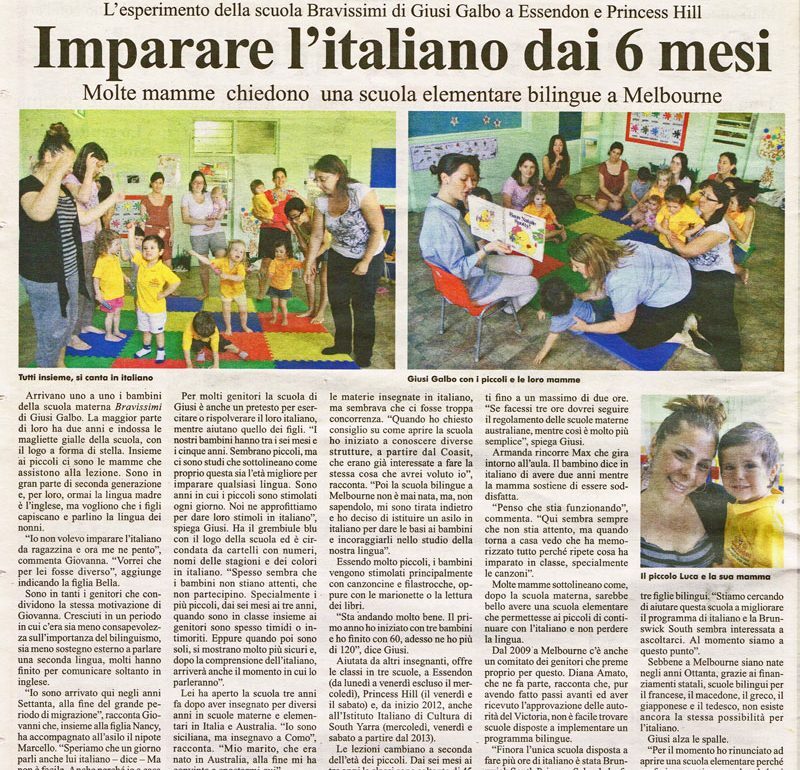 The best way for children to learn is to have a lot of fun while participating to a class where only Italian is spoken. Our program creates lots of variety and fun activities (different every week) in a stimulating and colourful environment in Airport West. 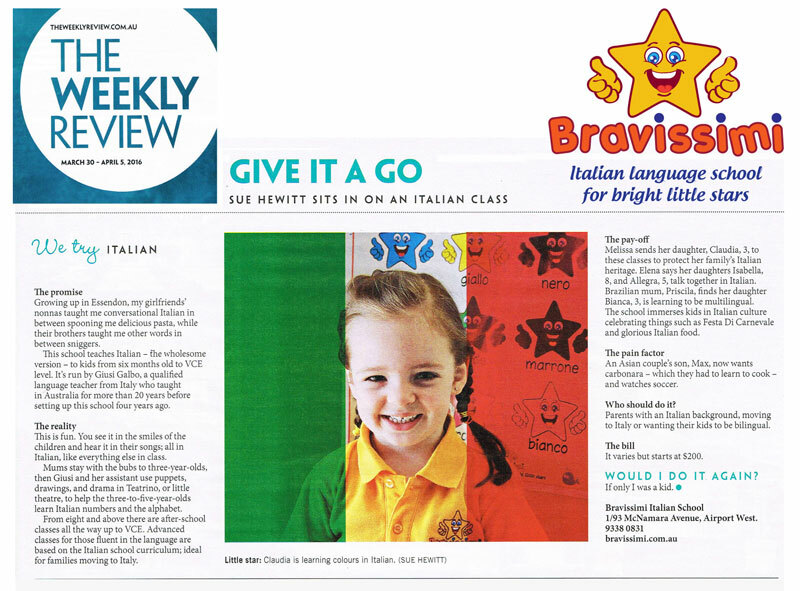 Bravissimi provides great Italian language classes to children from Pre-School, during and after school. 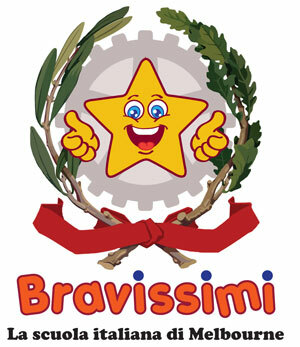 Bravissimi is open to all backgrounds willing to learn a second language rather than English. Are you serious about your child being bilingual? So are we! The Bravissimi curriculum is based on the current Italian Schooling System (structured in 4 terms per year, therefore it is beneficial to enrol for the whole year). Bilingual Kids: Endless Opportunities for LIFE! 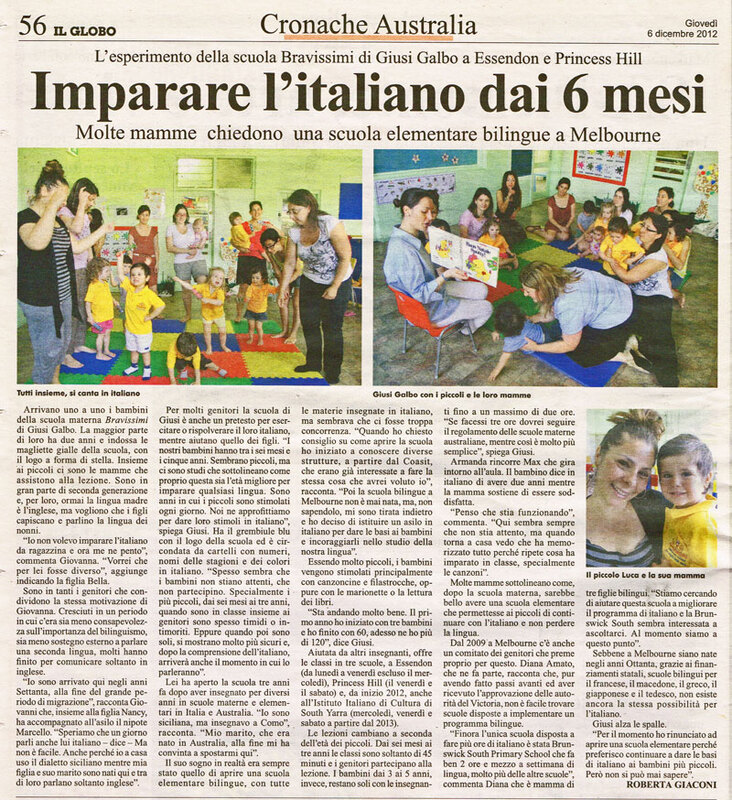 At Bravissimi we are dedicated to helping our students achieve the result of having fluency of the Italian language. 45 minutes classes – (8 children max): one teacher. All 1 – 1.5 and 2 hours classes (12 children max): two teachers. 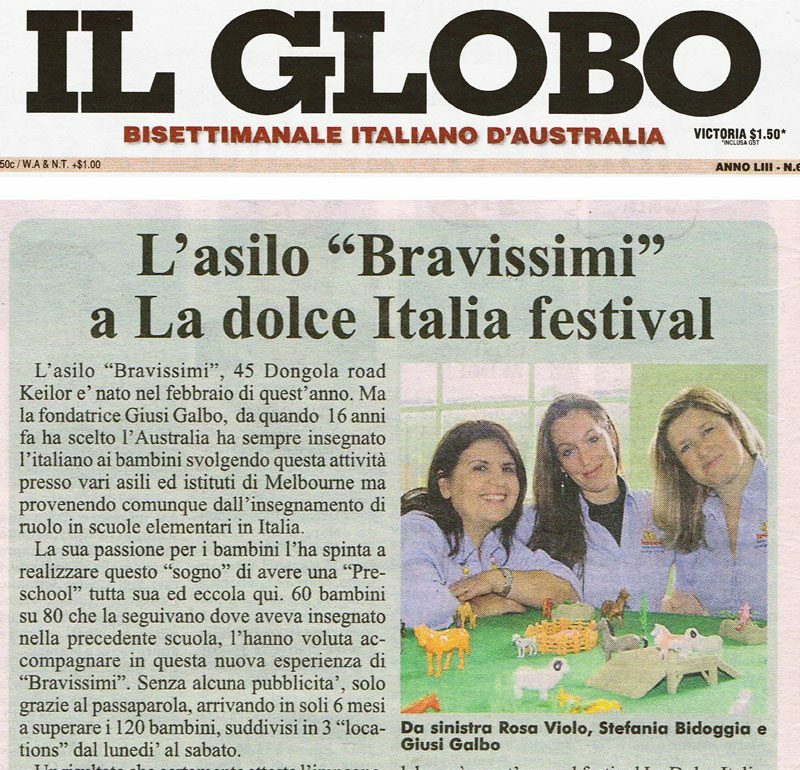 All the teachers at Bravissimi are native Italians and childhood experts. 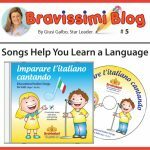 Learning Italian for kids is now much easier and better! Giusi, a childhood expert with over 20 years experience in working both in Italy and Australia is the program co-coordinator who structures the program based on the current Italian Schooling System. 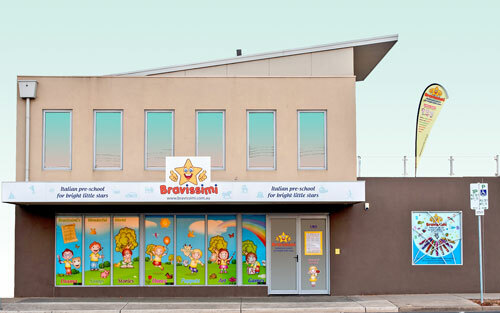 Bravissimi offers an ongoing education program from infancy to adult hood; we offer classes for children 6 months to 3 years (Stelline), 3 years to 5 years (Stelle), 6 years to 15 years (After School Class), school holiday programs and private lessons for people of all ages. VCE support is available also. Visit our Italian Culture Page. 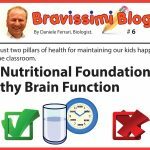 Get access to Bravissimi exclusive and specialised own published educational resources, from workbooks to games, CD’s, DVD’s and posters. Learning Italian is a great advantage for life and the earlier one starts the better. Learning a second language can help children improve their English verbal skills as well as their general analytical skills, including maths. Bookings are essential to guarantee your child spot, book now online.